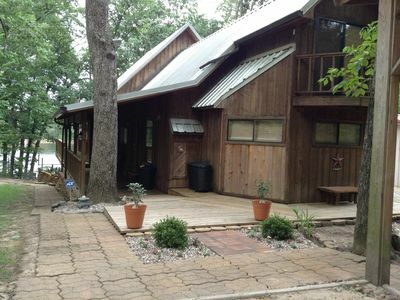 Toledo Bend Lake Home w/ Hot Tub, Dock & Fire Pit! 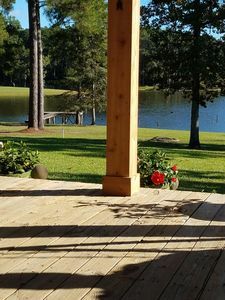 Escape to Toledo Bend Lake at this 3-bedroom, 2-bath Burkeville vacation rental home, nestled on a half acre of land right off the water. Spend your days launching a canoe or kayak right off the dock, barbecuing on the deck, or roasting marshmallows over the fire pit come nighttime - all while staying in this rustic, wheelchair-friendly home for 6! While the home is an ultimate summer destination, the private hot tub and cozy interior, make it a true four-season home! As soon as you arrive, head right down to the private dock, which lies only a short stroll from the home’s backdoor. Let the kids launch the paddle board or kayaks into the water, or take the whole family out on an afternoon boat ride in the motorized boat. These are available for an additional fee. After a long day on the lake, whip up a zesty barbecue dinner while everyone else spends some leisurely time on the hammock or tree swings. Come nighttime, let the festivities continue by starting up the fire pit and gathering for some tasty s’mores! On the colder months, the 4-person hot tub will ensure you’ll still have a cozy space to breathe in the fresh air. With all these outdoor amenities, the entertainment is truly endless! When you’re ready to head inside, you’ll find 1,840 square feet of warm and cozy living space. With 19-foot cathedral ceilings, 180-degree views of the lake, and exposed timber beams cut from trees harvested on the property, this charming cabin oozes rustic charm. Whether you’re relaxing on the comfortable leather couches, watching shows on the flat-screen TVs, or joining together for a feast on the 8-person dining table, the lake will be sparkling right in your line of sight! On those days that you do cook inside, the kitchen comes fully equipped with all necessary cooking appliances. Whip up a favorite recipe to spoil your loved ones! This Texas lakefront home is the perfect place to simply get away from the hustle and bustle of everyday life. Spend your days bird watching, boating swimming, fishing, or hunting. For optimum relaxation, let your children play on the nearby beach, which is surrounded by logs, while the adults relax on the hammock attached the nearby cypress trees with a gripping book. The entrance to the Sabine National Forest is just a half mile from this home. The 160,656-acre forest is the easternmost of the four national forests in Texas and forms part of the boundary between Texas and Louisiana. Enjoy hiking, fishing, or camping within this beauty wilderness area. 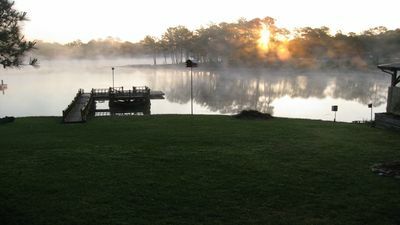 - Amenities include a fully equipped kitchen, furnished deck, 4-person hot tub, dock, fire pit (starter pack of wood provided), gas grill, tree swings, hammock, 3 flat-screen TVs with directv, Blu-ray player, air conditioning, in-unit laundry machines, driveway parking, boat parking, wheelchair ramp, and more! 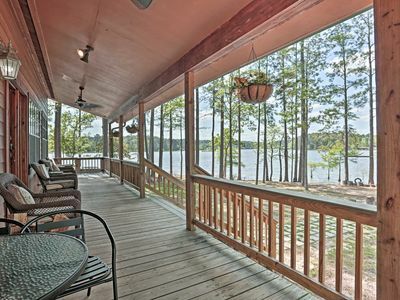 - Waterfront Toledo Bend Lake location! Enjoy easy access to boating, fishing, swimming, and more! Just half a mile from the Sabine National Forest. Waterfront Access! 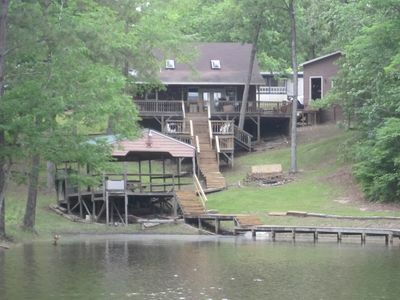 "We got it all in Skier's Cove on South Toledo Bend"